Did you know that the fastest and easiest way to add new features to your blog is by embedding widgets into the sidebar of your blog? To help you out, here is a list of the most popular and most useful widgets that can be added to your blog in no time. Scroll down to the bottom of this post for more instructions on how to add widgets to your blog. Don’t forget, these widgets can also be embedded using the HTML tab in any page or post as well! ClustrMaps – The most popular widget on Edublogs. Displays a small map with “dots” for each of your visitors. Flag Counter – Lists the most common countries that your visitors are from and shows the flag from each country. Who’s Among Us – With an account, includes some nice stat collection tools. My Web Counter – Simple and free visitor counters with many custom looks and designs. 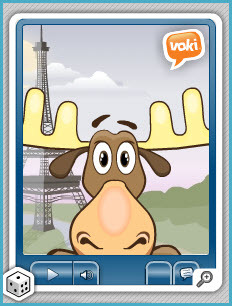 Voki – Add a speaking and highly customizable avatar to your blog. Record you voice, create a character, and much more! 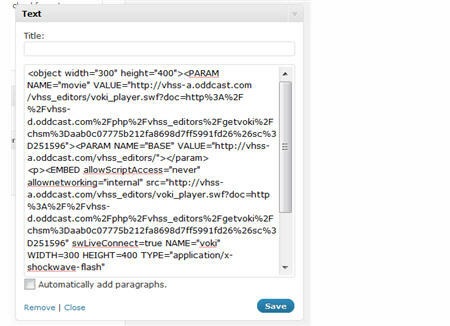 Read The Words – Human avatars that will read text or recorded audio right in your blog. Site Pal – A paid widget that can make scarily realistic avatars using uploaded photos of you or students. Clock Link – 100’s of different and unique clocks of all types. AccuWeather – The most complete collection of weather widgets to show current conditions and forecasts. Box.net – Create a file dropbox or upload widget for students to submit files for your review. Feed Wind – Display the latest posts from another blog anywhere on the web. Sweet Search – Place a search box for a trusted and safe for students search engine. *These widgets also will all work with Google Apps for Education users too! Google Calendar – Embed a list of upcoming events or a month view of a public Google calendar. Google Talk Chatback – Put a badge in your sidebar that lets users chat with you live when you are online. Your blog’s visitors don’t even need a gtalk account to chat with you. Google Maps – Embed a Google map – complete with directions, street views, and more. Google Gadgets – Choose from hundreds of different widgets, including games, trivia and more. Flickr Slideshow and Badges – Easily add photos from your flickr account to your sidebar. Facebook Photo Gallery – Show off your public facebook photo galleries right on your blog. SchoolTube MVP – Share popular videos from SchoolTube.com with easy sidebar access. YouTube – Place in YouTube channels or top trending videos. Mixpod – Create a music play list and share it on your blog. RadioTuna – Pick a genre and play music for your visitors. Google Translate – Instantly translate your blog into many different languages. Transparent.com Word of the Day – Audio and visual word of the day. Customizable in many of the world’s languages such as Spanish, French, German, Chinese and many more. Reverso Translation – Translorts, verb conjugators, and more in many different languages. Shelfari – Show off your favorite books for others to see. Education Atlas – Free thesaurus and dictionary widget with many features. 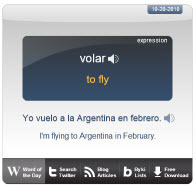 SitePal Widgetbox – Mentioned above, but this widget will allow readers to type in or copy and paste words to be read out loud. Science Score – A science question of the day. Students can even enter to win prizes. Wolfram Alpha – Quite possibly the best resource on this list – Wolfram Alpha contains hundreds of customizable math and science widgets, including unit converters, weather tools, graphing calculators, problem solvers, and much more. This might be the only resource math and science students and teachers need for their blogs! Info Please – Nice looking “this day in history” widget that displays multiple events and updates every day. Timeline Index – 30 different timelines showcasing several different periods of history – including US presidents, world history outline, philosophers, and explorers. WidgetBox.com – The definite go-to place to find and build your own widgets. 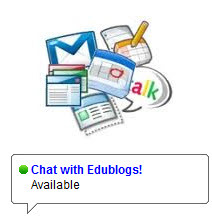 Edublogs uses several widgets from here on our main site! SpringWidgets.com – Another great source for widgets from many of your favorite sites on the web. User reviews and comments help you find the perfect widget for your blog. Widgipedia.com – Like the two sites above, wigipedia is a huge and growing collections of widgets of all types and sizes. 1. Choose the widget of your choice and copy the html code for it. 5. The widget will automatically open — just add the HTML code for your widget, click Save and then Close. 6. You should now see the widget in your blog sidebar! Since there are thousands and thousands of widgets to use, we are certain to have overlooked a few of your favorites. Leave a comment below with any that we missed so that we can add to the list! I cant get the clock one or the radio tunes one to work on my page. I am not able to add shlefari to my blog!! i have tried to copy the o’clock script, but its not come out in my blog. There’s only script i see in my blog, not the o’clock. What should I do? It seems that this is not as easy as the staff would like us to believe. I’m trying to get the email subscription on one of my blogs even though it is upgraded to Pro. Its not showing up as an option. Sorry to hear you are having trouble. If you haven’t done so already, can you email us at support (at) edublogs.org or use the Email Support link in your Pro menu to let us know your blog address and describe a bit more about your problem. We’re happy to fix you right up! Your support is always so comprehensive and thoughtful! Thank you! because the °Widget Sites & Collections° contain widgets including the category education. there are planety overthere, some plugins are actually plugins for widgets, they add new widgets to your blog. Thanks 4 these awesome widgets! Thanks very much for this resource. I was looking for a translator widget and behold…you provided quite a few. Much appreciated! I always have the YouTube widget in my blog’s sidebar so it advertises my YouTube channel and helps give my blog more content. Thanks for the list.